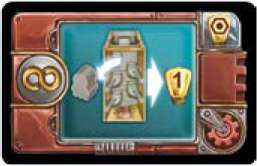 When gaining resources via Research Cards, always consider your Lab Capacities! You may not discard any Research Cards. You keep your Research Cards until the end of the game. 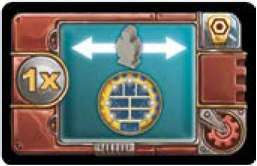 Every time you move your Engineer in the Headquarters onto a space with the depicted Programming Tile, you get the depicted reward: 2 Time Markers, 1 Crystal, or 4 KP. Here: You get 1 Crystal for reaching the red Programming Tile. 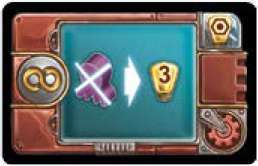 Every time you catch at least one Octopod, you get the depicted reward: 2 Time Markers, 1 Crystal, or 3 KP. Here: Every time you catch at least 1 Octopod, you get 3 KP. While moving, you may pay 1 Time Marker to place your Scientist on the opposite side of the Station. You may do this at any time in addition to normal movement. You get 1 KP for each Bot (except for your own) that is removed from a Loading Station because of you. 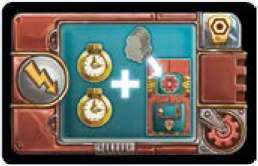 For the remainder of the game, you do not have to pay Time Markers when moving your Scientist through the Lock with the "2". 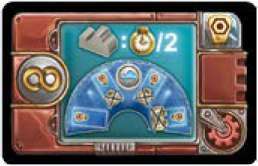 Every time you place a Submarine, you pay half of the depicted Time Markers (rounded down). 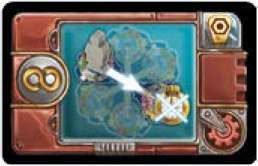 When moving your Engineer, instead of moving according to the arrows, you may move sideways in the Headquarters. 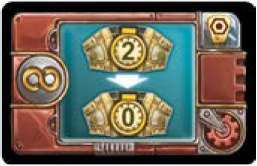 Note: In the round you activate this card, your Engineer will move 4 spaces in the Headquarters. 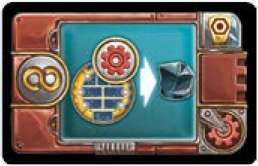 If you pay 1 Time Marker, you may place 1 Bot from your supply on the depicted Program Symbol. 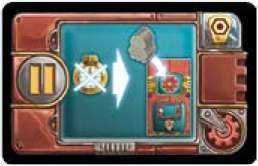 Take 2 Time Markers and place 1 Bot on the depicted Program Symbol. If this Program Symbol is occupied already, take 2 additional Time Markers instead.